Hi Everyone! I am so happy to be able to introduce you to our January scientist of the month, Bryan Clark. (I’m sorry for being late, I know January is almost over!) Bryan is a researcher who studies poisons for a government group called the Environmental Protection Agency. You can read his guest post Q&A below, and if you have any questions for him be sure to leave them in the comments. I’m a toxicologist, which means I study poisons. Toxicologists study a lot of different types of chemicals that can be poisons, from pesticides (the chemicals used to protect crops or your house from insects or weeds) to new medicines that have to be tested to make sure they are safe, to the exhaust that comes out of cars and factories (and many more). Some toxicologists mostly try to understand how chemicals affect people, but I am an ecotoxicologist – I study how the chemicals that humans produce affect wild animals. Also, I am a mechanistic toxicologist, which means that I don’t just try to find out how much poison in the water will make a fish sick or kill it, but instead I try to learn how the chemical causes the changes inside the fish’s body that can cause it harm. It takes a long time (or at least a lot of school) to become a scientist. What is one of your favorite memories from school or things that you learned while in school? In elementary school we learned about raptors (birds like owls and hawks) from the county naturalist, and she brought us owl pellets. When raptors eat something like a mouse they swallow it mostly whole because they don’t have teeth to chew it, but they can’t digest the bones. The bird packages up the bones and other indigestible parts into pellets and regurgitates them (kind of like throwing up). Scientists use the pellets to learn about what kind of food the raptors have been eating. The naturalist let us pick the owl pellets apart, and we were almost able to put together a whole mouse skeleton from the bones we found! 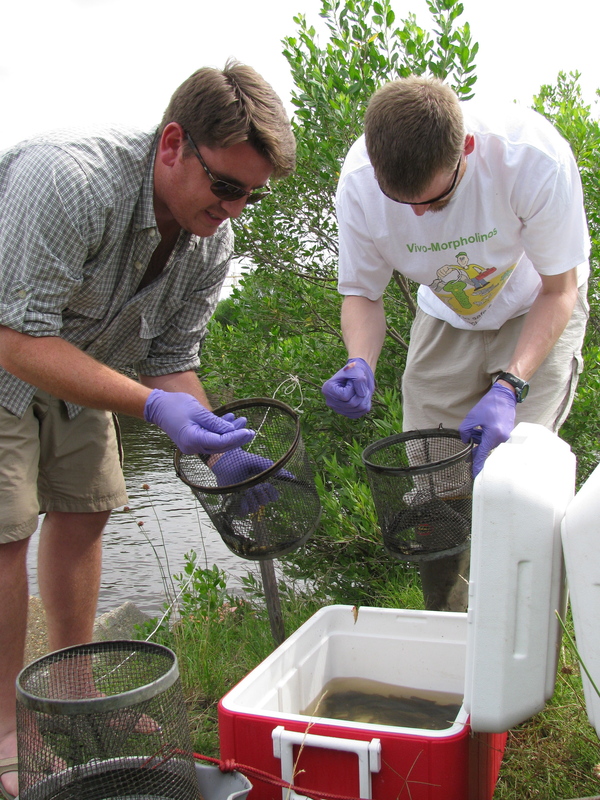 Bryan and a former labmate (Dr. Cole Matson) collecting mummichogs at a polluted site in Portsmouth, VA. Courtesy of Bryan Clark. Another great memory is from when I was in graduate school. I was working with a team of two other researchers trying to develop a tool for controlling genes in living fish eggs. It had never been used in wild fish like the one we studied. The team had spent years trying to get it to work, and we were getting close to giving up and moving on to other things. 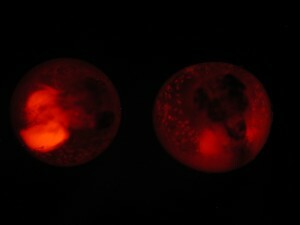 One day I was sitting in a dark room, staring into a microscope expecting to see a bright red glow in a mummichog egg that we had treated (which would mean that it still wasn’t working). Instead, I saw almost nothing! After checking to make sure I had actually turned on the microscope, I ran down the hall to high-five my teammates because we finally succeeded. Where do you work, and what do you do on a typical day at work? I work at a research laboratory in Narragansett, Rhode Island that is part of the United States Environmental Protection Agency (the EPA). The EPA is the part of the government that is in charge of keeping the air you breathe and the water you drink clean and safe. I study populations of a small fish called the mummichog that have evolved to survive in extremely polluted places where other fish can’t live. The pollution at these sites is so bad that even a small amount of mud from the polluted site will very quickly kill fish that didn’t grow up there. I am trying to learn how the fish have adapted to survive this severe pollution. On a typical day, I spend a lot of time reading about the results of other scientists’ experiments and planning new experiments with my labmates. 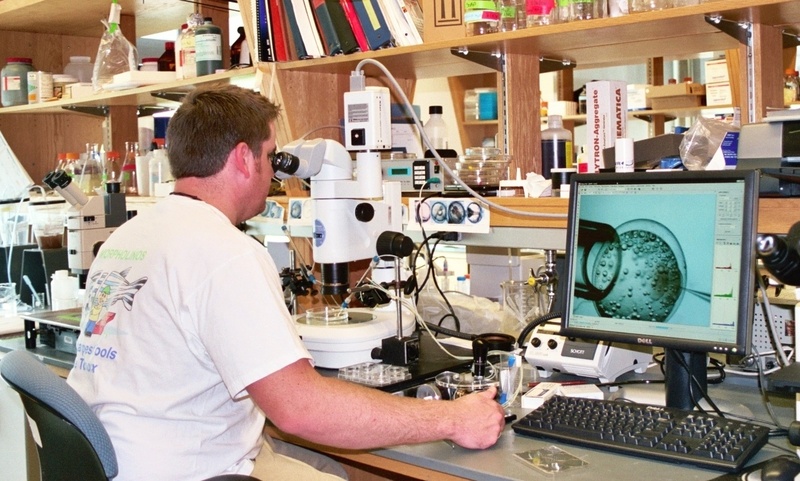 Then I do those experiments in the lab, which these days means trying to learn if the adapted fish have a unique version of a gene that interacts with chemicals inside the fish’s cells (we have the same gene in our cells). I also visit our fish in the lab. We have an amazing fish room that pumps seawater straight from the bay, and we have many fish from all over the Atlantic coast living in the lab (we even have some from New Jersey!) Throughout the year I also get to go to the estuaries (places where freshwater and saltwater mix) and catch new mummichogs to come live in the laboratory. A lot of our research is about how chemicals affect the young fish while they are still developing as eggs. I have always wanted to know how things work, especially living things. As I grew up, I learned that this is basically what scientists do – they try to learn how everything works. I was also lucky that both of my parents are scientists and I got to “help” with experiments when I was very young. My father is an ecologist; when I was in elementary school I got to ride along while he tracked radio-collared raccoons using a big antenna on the roof of a pickup truck. That’s when I realized that as an environmental scientist I could study science and spend a lot of time outside and around animals. I couldn’t imagine anything better! I get to work with and learn from really smart, fun people while researching things that are important for keeping our planet clean and safe. What is something you’ve found about either being a scientist or the subject you study that you think most people don’t know? I think a lot of people don’t realize how creative scientists are. Many people think that science is just boring, repetitive, and all about learning lists of facts, but those facts are really just the building blocks that scientists use to help them reach new discoveries. Research scientists are usually trying to discover something that no one else in the whole world knows, which requires a ton of creativity. To make discoveries, scientists have to look at the world in a whole new way and think of questions no one has ever asked before. Often, scientists study animals and places and other things that no one else has ever studied or create a specialized piece of equipment that doesn’t exist anywhere else. What are some of the things you like to do for fun? I like all kinds of outdoor activities, especially camping, hiking, hunting, canoeing, and fishing (I don’t just do it for work!). I have a great golden retriever who comes with me on most of my outdoor adventures. I also like to play team sports; soccer is my favorite. I really like cooking too, which actually has a lot of similarities to doing scientific experiments. Like many scientists I know, I drink a lot of coffee, so now one of my hobbies is roasting my own coffee from green coffee beans. Thank you Bryan for guest posting as the January scientist of the month! The scientist of the month segment was inspired by the stories shared on the twitter hashtag and tumblr I Am Science.